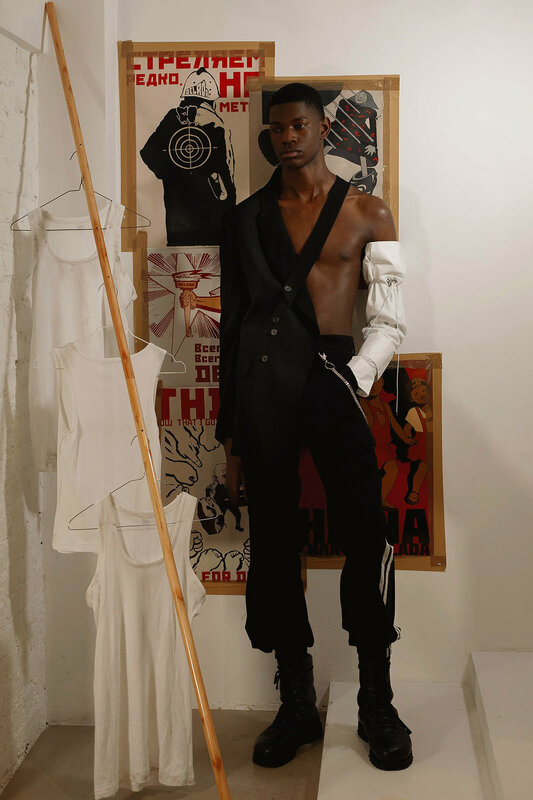 DELADA’s Autumn-Winter 2019 Menswear and Unisex collection “Underground” continues to be inspired by Lada Komarova’s Soviet and Russian upbringing, and draws on the bittersweet memories of living in a glorious and inspiring time with it’s dark and repressive side. Reflecting on Komarova’s very personal recollection of bygone Soviet society, focusing on positive experiences and the feeling that one was part of something bigger than just oneself. An ode to the mixed emotions initiated by the grandiose art and architecture Soviets experienced everyday, such as the beautiful Moscow underground stations being more of an art palace symbolising the “Bright Future Ahead” everyone in Soviet Russia hoped for. The collection’s title “подземka” or “Underground” is a reference to those grandiose Russian underground subway stations as a metaphor for “Soviet Paradise”, however it also refers to the “Underground” one had to seek refuge in order to survive the strict censorship rules during Soviet times. “I want the audience to be able to have a glance into my memories and my cultural upbringing, and share with them my positive and very personal emotions from these bitter-sweet times. The looks and especially the individual style elements I have incorporated in this collection bring me back to these bygone times and what the audience feel from this is up to their emotional connection with the collection.” Explains Komarova. The collection also mirrors the memories of the designer’s own experiences and life in Soviet times – the family’s small and in today’s standards rather shabby flat, life with very limited everyday comfort, a constant lack of quality food, the constant repressive Soviet propaganda, limitations on traveling, and most of all not being allowed to express oneself freely and instead being forced to fall in line and fit in. This collection represents not just the true past reality, but the designer’s “re-written memories”, like an illusion from the childhood that no longer exists. It is this glorified past, the memories of the grand “motherland”, that can easily be idealised, and consciously cleared of everything negative. It builds on preserving only the fond memories of ones younger years, he carefree times where the skies are blue at all time. But the reality we all know now was a rather sad and miserable existence, no matter what it may look like now through the selective blurry prism of years gone by. Furthermore Komarova references Russian contemporary artists Ilya and Emilia Kabakov and specifically their exhibition “We Are Living Here” , a body of works pondering on a large and ever-lasting palace, a paradise city built for the people, only for construction to never finish and the people living in the unfinished dream hoping for a brighter glorious future that was meant to be. This is the utopian hope Soviet people lived with during the Soviet time. Following the brand’s signature theme, the collection features elements Soviet staple styles stuck in the designer’s memory of Soviet life. For the Autumn-Winter 2019 Komarova looks back at the eclectic style of the late 80s and 90s in former USSR, when young Soviets accessed Western information and fashion through media and music for the first time. The result is a mix, match and restyle of existing fashion, using whatever they could get hold of to create their own trend. These elements blend together Western trends and Soviet staples for a unique wardrobe. Alongside reimagined classics, Komarova proposes suits combining and sport and formal wear, knitted asymmetrical jumpers with seams running across diagonally, structural outerwear pieces featuring bonded technical and laminated fabrics. Presented in mature greens, navy, beige, as well as other carefully selected earthy natural patterns, the collection invites the viewer to escape to the “Dacha of the Mind” – a poetic take on the traditional Russian cottage filled with memories of bygone Soviet times.